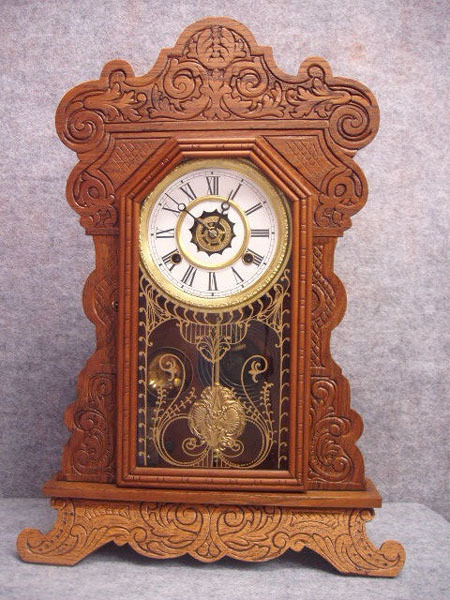 Waterbury Pressed Oak Shelf Clock, "Felix". Circa 1900-1910. Rococo Dial Rim, Replacement Paper Roman Dial, Cast Pendulum Bob, And Replacement Gold Patterned Glass. 8-Day Spring Wound Movement Strikes The Hours And 1/2 Hours On A Coiled Gong With An Alarm. Height 22 1/2" X Width 15" X Depth 4"